The women in James Bond films have not always had it easy. Since agent 007 appeared on screen for the first time in 1962, his numerous love interests have gone through significant changes over the following five decades. While, in the beginning, they were often exchangeable pleasures and victims of Bond’s openly lived sexism, they have steadily become equal opponents and alliesover time. One of those Bondgirls, as they are affectionately called by fans around the globe, is Corinne Cléry. In 1979, the French actress portrayed helicopter pilot Corinne Dufour alongside Roger Moore in ‘MOONRAKER’. A victim role. After helping Bond and being observed in intimacies with him, her appearance abruptly ends after just half an hour into the film. In the usual Bond manner, this only required a ruthless villain, two Doberman dogs and the snap of a finger. Nicaragua-born actress Barbara Carrera had quite a different role. Her appearance in the unofficial James Bond thriller ‘NEVER SAY NEVER AGAIN’ really scared some young male bondfans back in 1983. As cold-blooded killer Fatima Blush, she used mental torture and physical violence alongside a diverse arsenal of murder weapons – from C4 explosives with long-range detonators to venomous snakes. However, the ladies’ visit to the 7th Cineways International Filmfestival in Germany will be much more harmonious. The genre festival, celebrated in the cities Wolfsburg and Braunschweig from 29 August – 02 September, has some history of incorporating Bond into its programme. Back in 2016, actresses Caroline Munro and Martine Beswick joined the guest line-up, last year it was five-time Bond director John Glen along with Bondgirl Béatrice Libert. 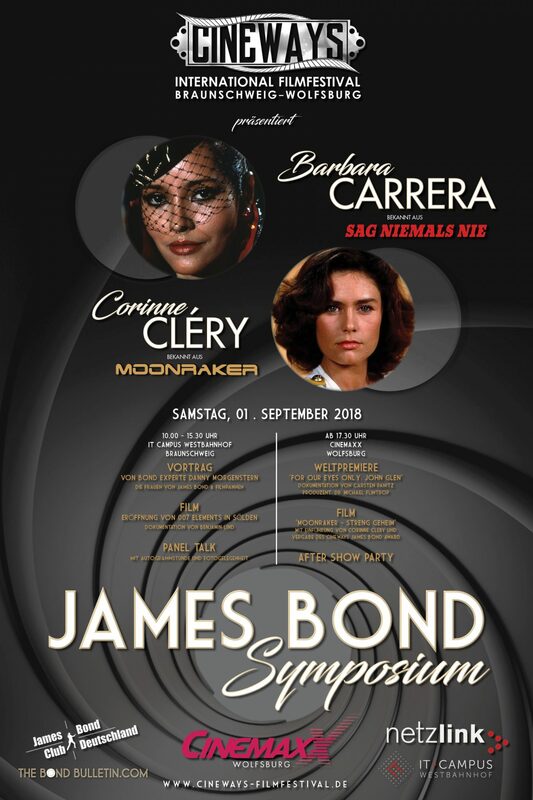 Due to the close cooperation between the festival and the James Bond Club Germany e.V., Bond fans will get their money’s worth at a five-hour James Bond Symposium in Braunschweig on 01 September from 10 am – 3.30 pm. The setting: the IT Campus Westbahnhof of Netzlink Informationstechnik GmbH – a modern and innovative event location with top notch technical equipment. Guests of the symposium can look forward to an exciting lecture by the Bond expert Danny Morgenstern on the topic “Women in James Bond films”. Among other things, he will explain why the women in the films are an indicator of equality between men and women. In addition, he will provide a funny insight into the numerous film goofs. As I will co-host the event for THE BOND BULLETIN, fans will be treated to my exclusive film from the opening of the James Bond cinematic installation ‘007 Elements’ in Soelden, Austria. On 10 July, I was fortunate enough to preview the installation together with a handful of fellow Bond aficionados from around the globe. Ultimately, the James Bond girls will probably attract the biggest crowd. Especially Barbara Carrera has never participated as a guest of such a festival before. In a panel talk, moderated by me, Carrera and Cléry will give insights into their careers as well as the making of their respective James Bond films. Afterwards, the actresses are happy to be available for photos and autographs. There will be a 2 hour break before the James Bond evening which will be celebrated at the CinemaxX cinema in nearby Wolfsburg. At 7.30 pm, director Carsten Panitz and festival director Dr. Michael Flintrop will present the world premiere of the Cineways in-house documentary ‘FOR OUR EYES ONLY: JOHN GLEN’, a fantastic film about the life and career of the versatile director with many new interviews of familiar faces from the Bond world. With ‘MOONRAKER’ as the feature film at 8.00 pm, actress Corinne Cléry will provide an introduction and also receive the Cineways James Bond Award from James Bond Club Germany president Andreas Pott. Cléry will be the third recipient of this unique award, following John Glen and Béatrice Libert in 2017.